This competition is closed. Congratulations to Melissa C., who was selected as the winner! We're giving away a set of Cuisipro Australian Standard measuring spoons to one reader who is willing to write a short (3-5 sentence) review of the spoons. We will publish the review on our kitchenware store website. An Australian Standard tablespoon has a 20ml (4 teaspoon) capacity. 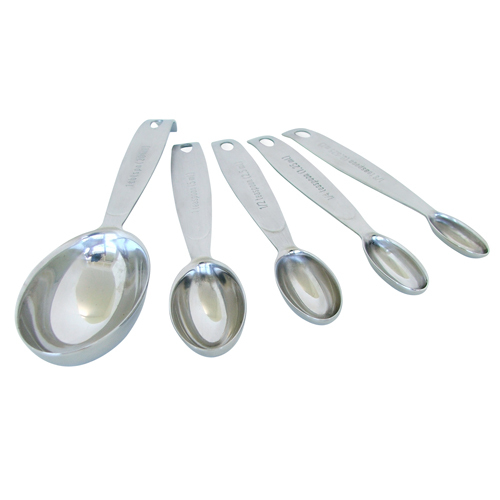 For readers outside Australia, Cuisipro also makes a stainless steel measuring spoon set with a 15ml tablespoon (available from Amazon.com). To enter the competition, email comps@exclusivelyfood.com.au and tell us about your current measuring spoon set. The prize is valued at $22.90 including delivery. Competition closes 13 February 2011. We will select our favourite response and post the winner's name on this page by 16 February 2011. The competition commences on 8 February 2011 and closes at 11.59pm AEDST on 13 February 2011. There will be one winner, who will receive a set of Cuisipro stainless steel measuring spoons from Exclusively Food Kitchenware Store. The winner must be willing to write a short (3-5 sentence) review of the spoons. My Grandmother gave me her plastic set of measuring spoons when I was a child. I am 71 years old now so you can see it was about the time when Plastic was invented. They are so old now they are cracking. Stainless Steel is the only way to go. Maybe they will be in the family for another 60 odd years.